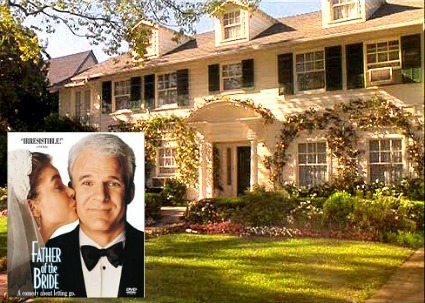 A reader named Jillian posted a link to this house for sale in Chapel Hill, North Carolina, and said that it reminded her of the Father of the Bride house. I think she’s right — it does have a similar vibe. The house has 5 bedrooms and 6.5 baths. I think it’s safe to say there would never be a line for the shower at this place (unless you had 7 kids). It has 6,400 square feet, sits on half an acre, and is on the market for $2.875 million. I’m crazy about porches, and this place has more indoor-outdoor types of spaces than you can shake a stick at (not that you’d want to shake a stick at a porch). I don’t even need the rest of the house — I’d be happy to just live on this screened porch. Maybe I can work out some sort of arrangement with the owners. 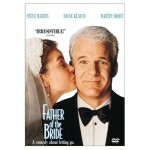 You are right – very Father of the Bride – I love it! Can that house be any awesomer? Looks like they forgot to decorate the kitchen, or, hello major minimalism. feel like your outside even though you are inside. It’s so beautiful! I love the kitchen! I live in N.C. about an hour from Chapel Hill. This is what most of our houses look like…very southern and very gracious. All are not this large, of course. Homes in our subdivisions are custom and not planned by a builder. Thank goodness that trend hasn’t caught on over here.All homes enjoy wood mouldings and yards full of azaleas. Thanks for the delightful tour today. Can’t wait for the rest!!! Julia… you’re email to me “here” link is not working… by the way… Lime in the Coconut blog already put a house on the tour today… you might want to pop over and take a look. Off to get my friends’ mini Heart Castle posted… yea! Will email it to you. RE: changes you made for the button—–I noticed the red door and and red lawn chaise with what I think might be a pet of some sort??? My aging eyes are not as sharp as they once were. LOL The house is supendous and a marvelous way to start off the tour. Thanks for hosting this. can’t wait for tomorrow! so excited! I too love all the Sun rooms in this place. or sun porches. That Bathroom was wonderful too. I loved that bird faucet too. I have more to go check out. I shall be back. I love that ceiling medallion so much I’d scrape it off with a butter knife if I had to (to take it with me when the house sold). Wow! I love this house and the stuff I don’t love (crazy sink in the master and fowl faucet-yuck) I’d live with. This is totally my dream house…until I find my next dream house. That house is gorgeous!!!! I loved everything! Okay. I have NO idea how to make your house tour button link back to your site. I’m an idiot. But I almost have my post done. Whew. O my gosh Julia, you could not have posted this house at a better time! We’re getting ready for a dining room makeover and that dining room has my colors, right down to the tee….I will be taking a look at that photo many times in the next few weeks. I’m posting my “design challenge” Wednesday afternoon. Our room isn’t as big as the one you posted, but I plan to use elements of that room. If its 3,000k in Chapel Hill, how much in River Oaks TX, Grosse Point MI, Main Line PA, Larchmont NY, or the flats of Beverly Hills CA? As for The Secret, I think it help you own a media empire. So your on your way with the blog. I have a feeling tomorrow is going to be like watching fireworks! Hi, my post is up and ready whenever you are! It’s beyond gorgeous! I love the hallways that follow the outer side of the house with windows. Gorgeous! I’ll take it…that is if I had 2.9 million to spare and lived in NC! Oh well, I guess I’ll have to be happy where I am. I love that house. Love. It. Can’t wait for the whole tour! It’s beautiful! I love the long sun room – it’s so cheerful. Just begging for me to come sit and read a book. I love, love, love, love, love it. Every bit of it. Except for that hideous swan sink fixture. I’ll take it! 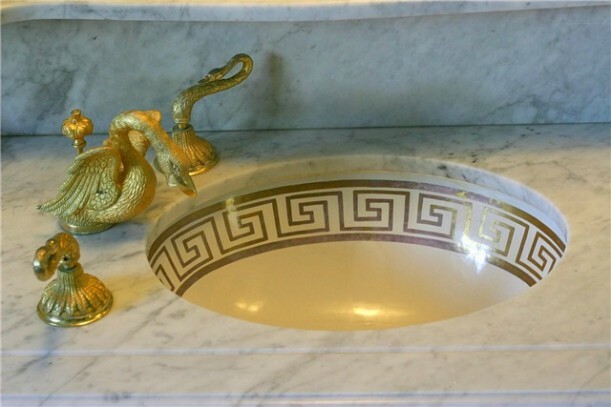 I love everything about this house (I’m a little iffy on the gold swan faucet, although I love the greek key sink). What a great find! We’re with you – the porches are the BEST! The last one – the big one – wow! We’d live just in that room – no need to go anywhere else!! Got the post on – we’re ready!! Can’t wait to take the tour tomorrow!! Oh my gosh. I am not joking when I say this is my dream house. 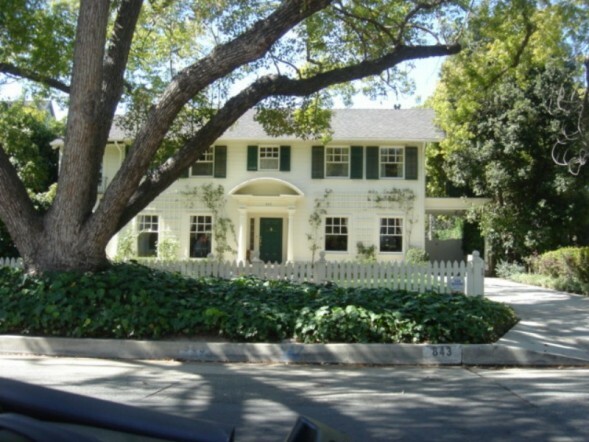 I actually based my exterior of my house on the Father of the Bride house. I showed my architect a picture of it! I love every detail. THANK YOU for showing it!! It’s SO worthy. hey Julia…couldn’t get my act together in time, so I don’t have a post I can participate with…but…I’ll send people your way for the part-ay! My tour is all ready, I don’t know where to send the link! Ah, that house is perfectly beautiful. Love the Tiffany blue dining room, the porch-like areas, the exterior. So homey AND elegant. The yard is very North Carolina – where I live. Love it. I do like the red front door the artist added. THAT is ALOT of house ! WOW!!! That’s all I can say…this house is SO my taste! I love, love, love it. I love this house. I love that robin’s egg blue in that dining room. Thank you for sharing, yet again, another great house. Thanks so much for hosting this home tour. I have enjoyed looking at homes from all over. All the different styles. It’s amazing. I’m imaging myself walking from home to home putting on the little booties and taking it all in! THANK YOU! I have always wanted a sun room….. I am drooling at this have haveing so many! That house is about as close to perfection as any you have shown us. So gracious but homey. I would lighten up the kitchen, hire the maids/cleaning people and sit back with a nice glass of Cabernet. I LOVE the stencil on the ceiling…and the sunroom with the wicker!! Great Post!!! Love all the tours! The house tour has been so much fun. Thanks for thinking of this great way to find like-minded people and new places to gleen inspiration. As a misplaced Southerner living in Connecticut, this house makes me hurt for home! It takes me back to my mom’s kitchen. I love it. So homey. I am totally a screened in porch girl too. Our first house had one with french doors and a brick floor. Man I miss that space. There is only one thing that would make this house better – come on say it with me – CRYSTAL DOOR KNOBS! Thanks for doing this Julia. What an incredible amount of work for you and a ton of fun for us. OK that is just beautiful! WOW is all I can say! Thanks for the tour! Thought you might want to take a look at it for fun! Just found your site this morning…this is exactly the kind of stuff I love. that house is perfect and i was in agreement. i just want the porch and that bathroom…omg. beautiful. no red and black with mirrors in the master but who cares. wow. nice. now about the secret. it works to a degree. but, it really isnt a secret. i’ll tell you my quick tale and you can do or say what you please. i believe that asking God for exactley what you want will get it. as long as you keep working along trying to achive it. ok here goes. 1. when i was a young girl i wanted a dark haired pretty healthy fat baby girl. took me several years but my daughter will be 16 soon. shes chubby but she is very nice and perfect in my eyes. 2. i wanted a job to support my kid making at least 30,000 a year. last year i brought home about 65,000. the year before almost 70,000. this year perhaps 55,000. and my job is for the most part pretty secure. 4. i wanted a car that had no more the 30,000 miles on it but less then 5,000 dollars. wanted it large like a caddy and wanted to be painfree when driving it. well i won a car on dec 30 a 2009 chevy malibu with less then 300 miles on it and i paid in taxes 1,500 dollar or there abouts. 5. i prayed for someone to love me and i used his name. he is my best friend and he does love and care for me alot. i dont know what hold for us in the future but, i am with him threw good and bad and i have told him that too. 6. i am currently praying to win a large sum of cash. like over 500,000 dollars. (my house is worth like 40,000 i paid like 55,000 for it so i will be set if this happens) at first i wanted like muti million of dollars becouse i wanted to give half to God and pay the taxes and do whatever. but, currently i was on the hoosier lottary web site and some woman won 500,000 dollars. i dont know what she will be doing with it. not my thing to worry about but, i felt a question in the back of my head. and it said what if you only won 500,000 would you still give me half. and i thought about it and said yes, God, yes i still would. i would still be set. still have to work but perhaps that is what God wants me to do. still go to work. who knows. 7. my job. currently they are trying to get rid of days. and i felt the calling to go to an afternoon shift where i would earn more money in a higher level job and earn night money and weekend premium. knowing that the big ax was going to be coming down around 14feb09. well they put a news bullition out to some of the supervisiors that i was not ment to see but saw it anyways. and everything is coming to pass as i saw it back in late october of 2008. GOD IS THE SECRET. you can have all the dream boards you want but, you still need to pray and spread the word of God. on my car that was givin to me from God i have a God is awesome designer plate , the fish on the back, and the indiana in God we trust plate on it. my plate numbers have my daughters initals on it and i didnt “pick out “my plate or order it. and i won the car the day after her 16th birthday. also the numbers are my moms birthday on it and my best friends birthday with his year of birth. also has the birthday for my daughter in the numbers. God is the man. that is the secret. The house was nicely done. I loved the porches (both with and without screen), the kitchen and the den. I like the glass windows and the effect it gives to light up the rooms specially the area with the 2 wicker chairs, it’s a good place to read a book or catch a few Zs. As for the secret, it’s no secret, you have to pray for it exactly however as the saying goes, “be careful of what you pray (wish) for as it might come true”, and when it does, it’s a no return no exchange deal. I never thought someone would satisfy my addiction with film houses! I have spent numerous hours on the web treying to fing pictures of many film houses and yours is the best yet, if not the only eligible! Any pictures from the above would make very so thankful to you and very happy! I’ve tried to locate the home they used in Jumanji, Sara Whittle’s house seen only briefly in the film but the wrap around porch still haunts me. I know the film had multiple locations in New Hampshire, Maine and British Columbia and wondered if there was a way to locate this particular house. I just came across your site, as I’m looking to move out of NJ and well I clicked on your link and I will definitely be following your blog from now on!!! This home above is simply LOVELY!! Three things that I love the most about it are: 1) The side porch (too adorable), 2) the backyard is immaculate and 3) I wanted to ask you if you knew what kind of light fixtures they have above the island in the kitchen??? (I love those too). Thanks a lot for your blog as I too love to take random photos (while driving) and snap a shot of a home if I like something about it 🙂 Have a great day! Thankyou Julia for your site – it’s fantastic, but so addictive and I’m not getting anything else done…! I’m in Canberra Australia (our capital city) and just thinking how wonderful it is to be able to enjoy the magic of so many beautiful overseas homes from my loungeroom sofa. I look forward to sharing whatever you come up with next. No doubt something for us all to drool over (and to pick up some wonderful decorating ideas).